48 PIGAFETTA, F./ DE BRY, Th. Tabulam hanc Aegypti, si aequus ac dilignes lecot,.. Francfort, ca.1597. Carte grav�e en 2 feuilles non jointes. Belle impression de ces cartes en parfait �tat. Infimes rousseurs. - A good and dark impression. On two separate sheets, dimensions if joined : 55 x 40 cm. Very good condition. 550 x 400 mm. � Pigafetta r�alisa cette carte d'Afrique d'apr�s Duarte Lopes, un explorateur portuguais, qui avait collect� de nombreuses informations sur le bassin du congo. Il s'agit de l'�dition regrav�e pour l'�dition des "Petits Voyages" de De Bry, d'apr�s celle publi�e par Pigafetta, dans son ouvrage "Relatione del reame di Congo". - One of the most beautifully engraved maps of Africa ever produced, ornamented with numerous ships, sea monsters, and elaborate cartouches. 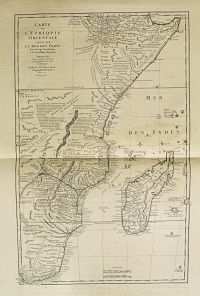 One of few early maps to make a meaningful alteration in the geography of Africa, it changes the Ptolemaic conception of the sources of the Nile from two lakes side by side to two lakes one on the top of each other, and conforms more closely to the actual locations of Lake Victoria and Tanganyika. This is the De Bry's re-engraved edition of Pigafetta's very rare, two sheets work published in his book "Relatione del reame di Congo". 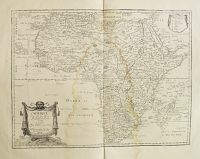 - Tooley, MCCS No.29,#134; Norwich, Map 16; Betz, The mapping of Africa, p. 35-36, with illustration. 49 SANSON, N. Afrique. Paris, Mariette, 1650. Beau col. ancien. Rousseurs, p�les mouillures, fente en bas du pli central (sans manque), 2 taches d'humidit� de chaque c�t� de la carte. Bordures et cartouches colori�s � l'�poque. - Paper slightly age toned, split in lower part centerfold, minor water staining and brown spotting, 2 water stains at right and left part. 390 x 553 mm. 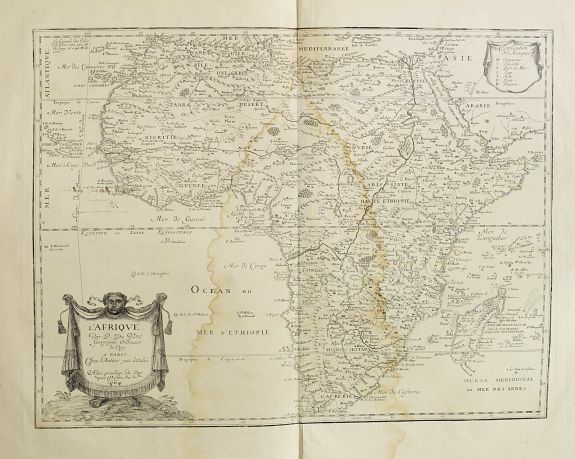 � Carte d'Afrique grav�e par A. Peyrounin, avec les bordures et cartouches colori�s � l'�poque. - Map of Africa with scale borders and title-cartouches brightly coloured at the time of publication. The map is engraved by Peyrounin. 50 DUVAL, P. L'Afrique. Paris, 1664. D�coup� au filet d'encadrement et remont� anciennement sur papier ancien, large mouillure centrale. 410 x 535 mm. � Grav� par Somer. - All the lakes, rivers, bays, and towns of maps of this period are here. - Norwich's Maps of Africa, map 38. 51 ANVILLE, d. / SANSON / DUVAL. (Afrique). Paris, 1656 � 1732. Cartes coup�es au filet d'encadrement, certaines remont�es sur papier ancien � l'�poque..
� Lot de 18 cartes de format in-8 et in-4, des diff�rentes r�gions d'Afrique, par d'Anville, Sanson et Duval. 52 BRAUN, G. / HOGENBERG, F. Algerii Sarace norum urbis fortissimae. Cologne, 1575. Bel exemplaire. 350 x 497 mm. � Vue d'Alger et de ses fortifications, avec une table de renvois en bas : A-Z et 1-47. 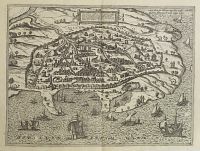 Publi�e dans le "Civitates Orbis Terrarum" . - An attractive plan of Algiers, including a numbered key legend in the lower part. 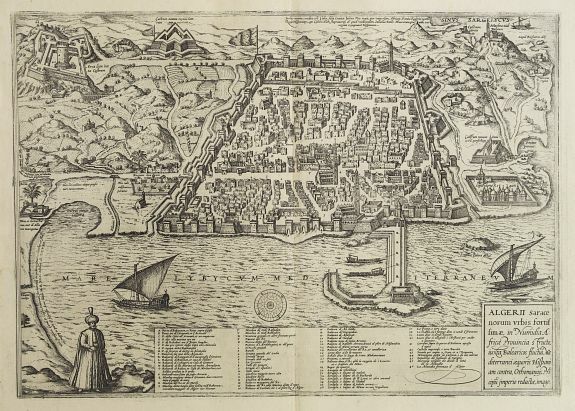 A splendid view of the walled city and port, extensive key below gives all the important landmarks and locations. From the greatest publication in this genre!. The "Civitates", was compiled and written by George Braun, Canon of Cologne Cathedral. Braun gathered together vast amounts of information and draft plans to produce over 500 city views and plans, published in six parts between 1572 and 1617. 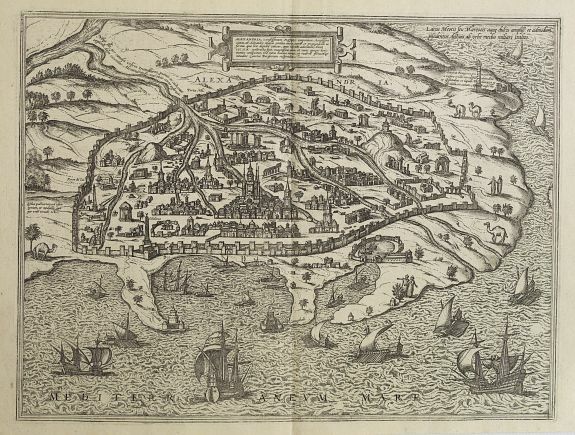 53 SEUTTER, M. Oran munita urbs.. / Topographica Repraesentatio Barbarici Portus.. Oran Augsbourg, ca. 1700. Beau col. ancien. P�les mouillures en marge d'une carte. - Faint water staining in the margins of 1 map. 471 x 536 mm. 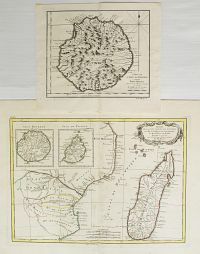 � Ensemble de 2 magnifiques cartes repr�sentant le plan et le panorama de la c�te d'Oran avec de nombreux bateaux au premier plan, dans un somptueux coloris d'�poque. L�gende en latin et en allemand. 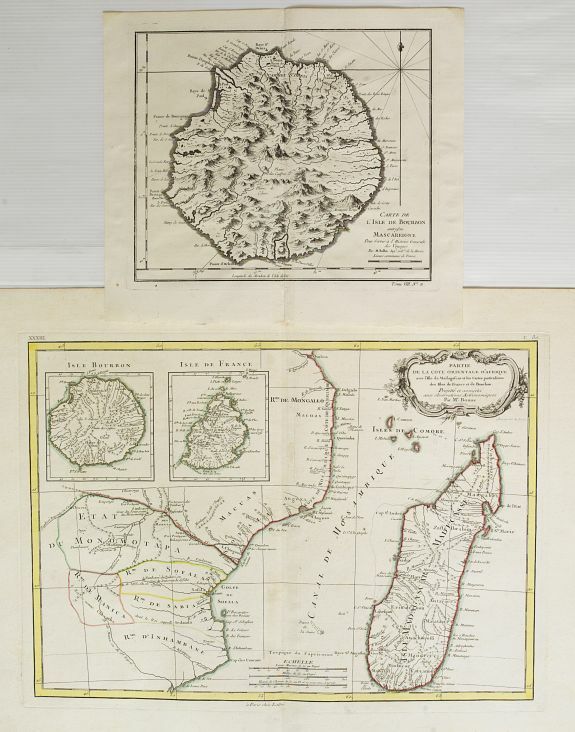 - Two maps representing the vicinity of Oran with panoramic view from the sea below. 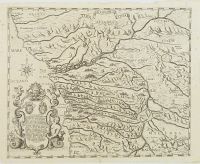 One map with allegorical title cartouche. 59 BRAUN, G. / HOGENBERG, F. Alexandria vetustissimum Aegypti emporium.. Cologne, 1575. Belle impression. 363 x 483 mm. � Vue d'Alexandrie publi�e dans le "Civitates Orbis Terrarum." - A superb image of Alexandria, the famous Egyptian center of learning. From Braun and Hogenberg's "Civitates Orbis Terrarum". The "Civitates" was the first standardized collection of town views and plans encompassing the known world at the time. Braun and Hogenberg compiled the famed "Civitates Orbis Terrarum" in six volumes from 1572 through 1618. 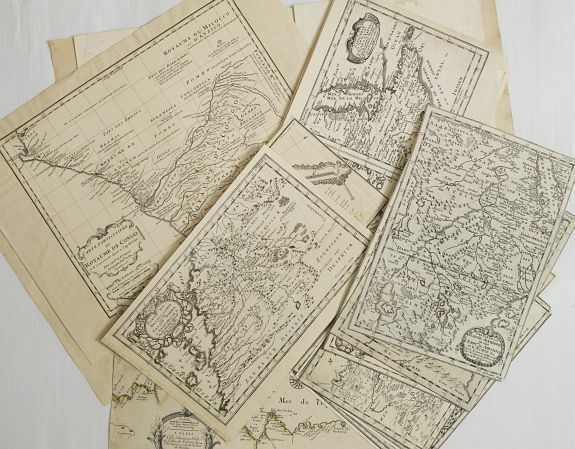 These atlases gained such a high level of popularity that there were numerous reprints in various languages, even before final volumes were published. 61 FER, N. de. Le Cours Du Nil, Suivant Les Auteurs Modernes et les dernieres Relations. Paris, 1720. Limites en col. ancien. Papier un peu froiss�. 465 x 630 mm. Deux cartes sur 1 feuille. - Two maps on one sheet: a general depiction of the Nile Valley and Egypt, and a smaller map focusing on the delta region with detail of ancient civilization. 65 CORONELLI, V.M. 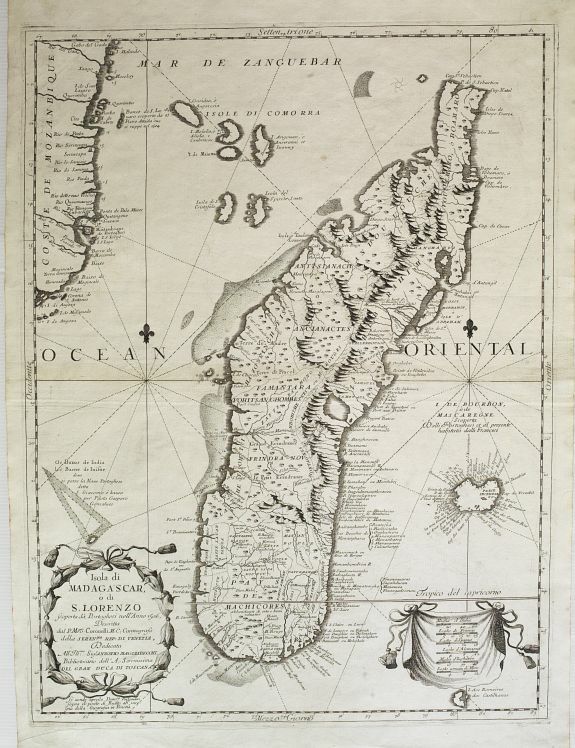 Isola di Madagascar o di S. Lorenzo Scoperta d� Portoghesi nell anno 1506. Venise, ca. 1690. Bel exemplaire. 595 x 450 mm. � Belle carte de Madagascar orn�e d'un cartouche de titre et d'une �chelle. Comprend �galement l'Ile Bourbon et les Comores. 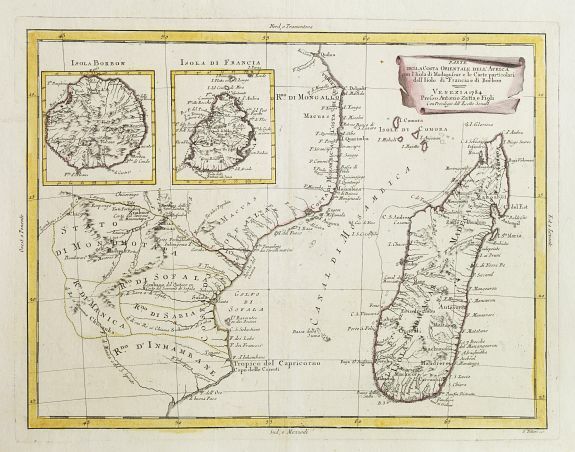 Decorative and highly detailed map of Madagascar, including 2 decorative cartouches and other embellishments. The remarkable Vincenzo Coronelli (1650-1718). He was cosmographer to the Republic of Venice and founder of the "Academia Cosmografica degli Argonauti", the world's first geographical society (1680). 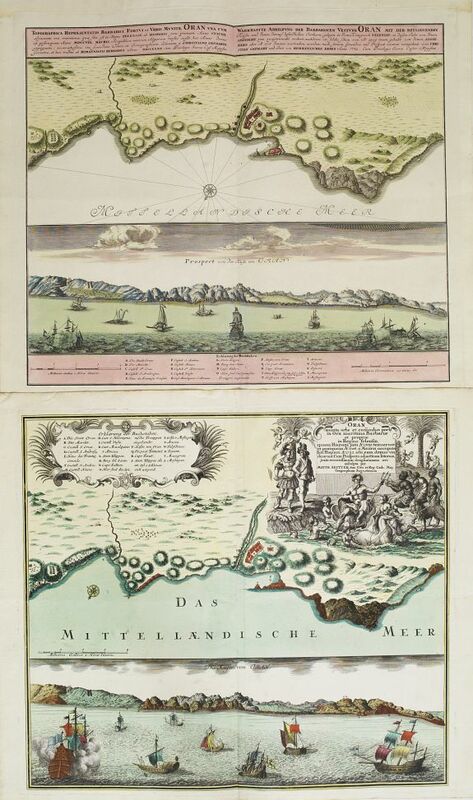 He was also one of the most prominent mapmakers and publishers in Europe of his days. 66 ANVILLE, J-B. Bourguignon d'. 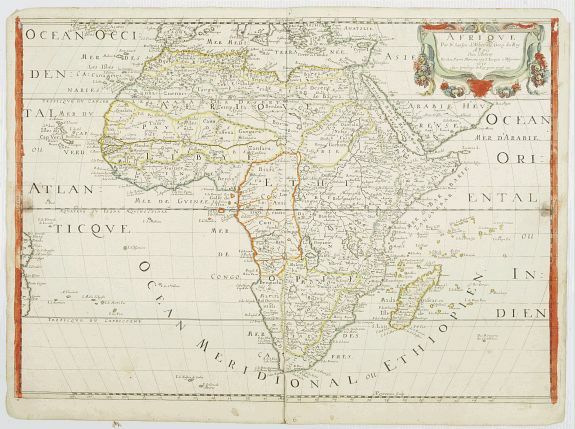 Carte de l'Ethiopie Orientale situ�e sur la Mer des Indes� Paris, 1727. Large mouillure centrale. 640 x 410 mm. 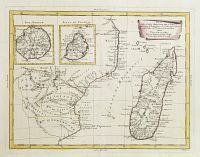 � Carte de la c�te orientale de l'Afrique avec l'�le de Madagascar grav�e par Delahaye. "Dress�e sur les meilleurs m�moires principalement sur ceux des Portuguais". 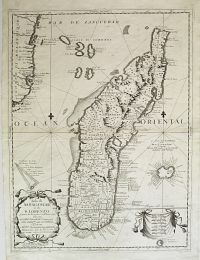 67 LATTR� / BONNE, R. Partie de la Cote Orientale d'Afrique avec l'Isle de Madagascar.. Isles de France et de Bourbon. Paris, ca. 1783. Limites en col. ancien. Bel exemplaire. Infimes rousseurs. 295 x 412 mm. 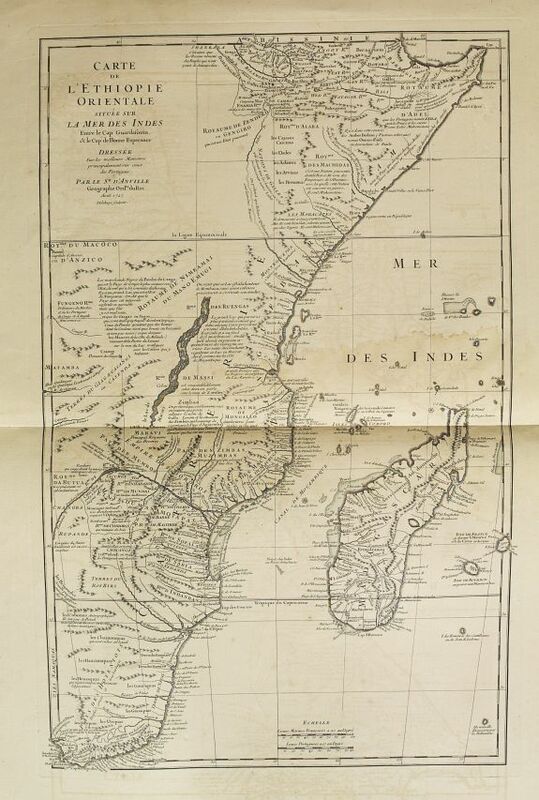 � Carte de l'Afrique de l'ouest avec Madagascar amplement repr�sent�e. La carte est surmont�e de 2 cartons repr�sentant l'"Isle Bourbon" et l'"Isle de France". Joint : Bellin. Carte de l'Isle Bourbon. 210 x 240 mm. (lot de 2 cartes). Attractive map of part of South Africa, including Madagascar and 2 insets with the Reunion and Mauritius Islands. 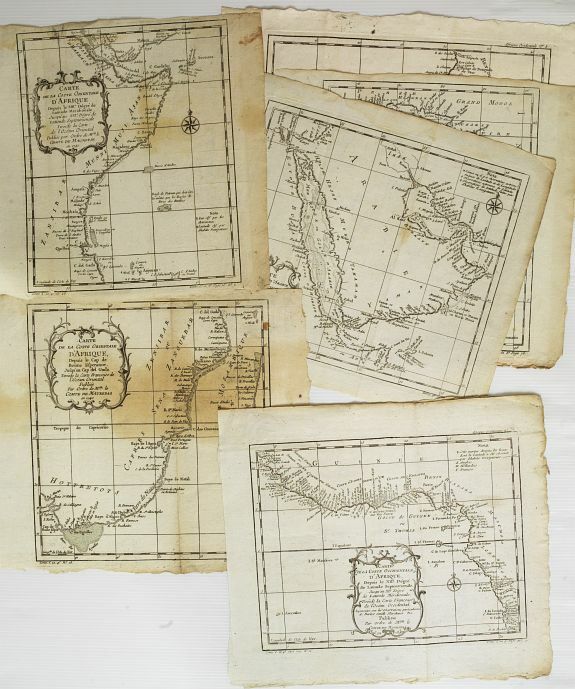 Rigobert Bonne (1727-1795 ) was one of the most important cartographers of the late 18th century. 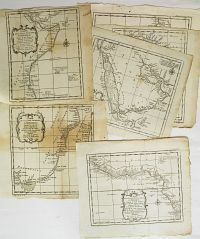 In 1773 he succeeded Jacques Bellin as Royal Cartographer to France in the office of the Hydrographer at the Dep�t de la Marine. Working in his official capacity Bonne compiled some of the most detailed and accurate maps of the period. 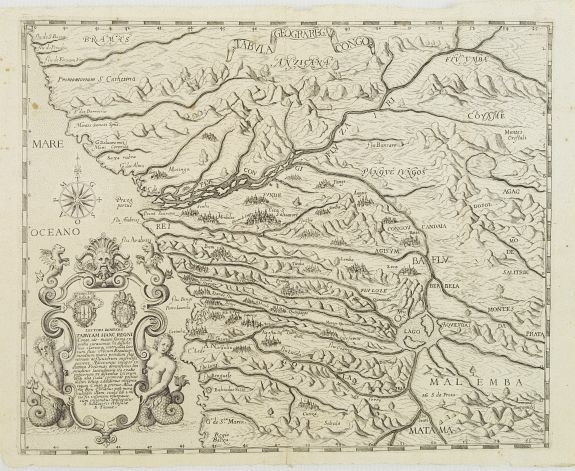 Bonne�s work represents an important step in the evolution of the cartographic ideology away from the decorative work of the 17th and early 18th century towards a more detail oriented and practical aesthetic. With regard to the rendering of terrain Bonne maps bear many stylistic similarities to those of his predecessor, Bellin. However, Bonne maps generally abandon such common 18th century decorative features such as hand colouring, elaborate decorative cartouches, and compass roses. While mostly focusing on costal regions, the work of Bonne is highly regarded for its detail, historical importance, and overall aesthetic appeal. 68 ZATTA, A. Parte della Costa Orientale..Africa con l'Isola di Madagascar. Venice, 1784. Beau col. ancien. Bel exemplaire. 307 x 400 mm. � En cartouches : Isola Borbon et Isola di Francia (Maurice). 69 PIGAFETTA, F./ DE BRY, Th. 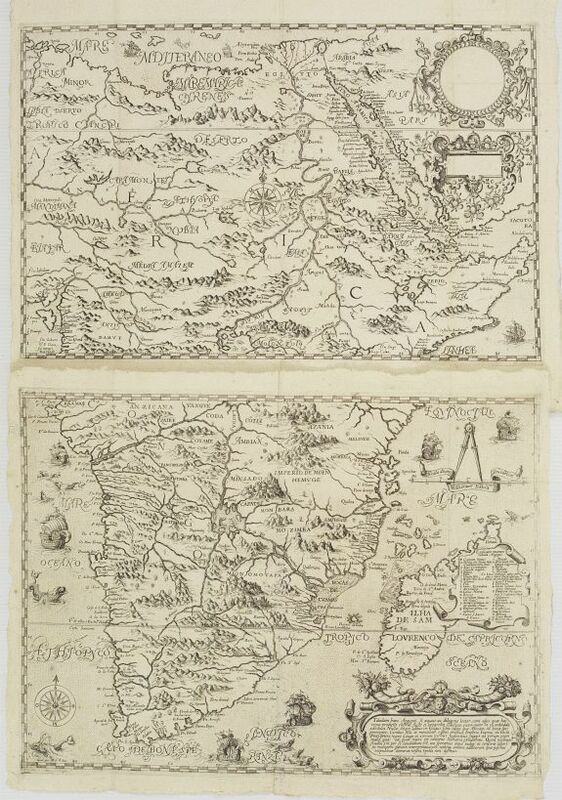 Tabula Geogra: Regni Congo. Francfort, ca.1597. Belle impression de cette carte en parfait �tat. Infimes rousseurs. - A good and dark impression. Very good condition. 305 x 375 mm. � Pigafetta r�alisa cette carte d'Afrique d'apr�s Duarte Lopes, un explorateur portuguais, qui avait collect� de nombreuses informations sur le bassin du congo. Il s'agit de l'�dition regrav�e pour l'�dition des "Petits Voyages" de De Bry, d'apr�s celle publi�e par Pigafetta, dans son ouvrage "Relatione del reame di Congo". - Pigafetta drew on the work of Duarte Lopes, a Portuguese explorer who collected a mass of geographic information on the Congo and its basin. 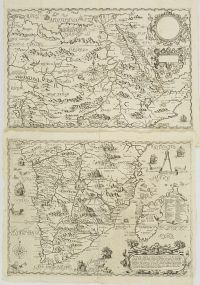 This is the De Bry's re-engraved edition of Pigafetta's very rare map published in his book "Relatione del reame di Congo". 70 BELLIN, J.N. Afrique. 7 cartes. Paris, 1758. Infimes rousseurs. 250 x 260 mm. � Lot de 7 cartes des c�tes est et ouest de l'Afrique. 71 FER, N. de. Cap de Bonne Esperance. Paris, 1705. Bon �tat. - Good condition. 25 x 352 mm. 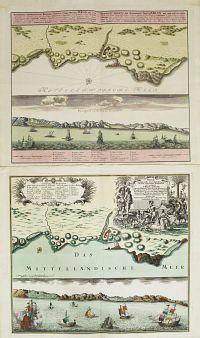 Three views on one sheet, depicting the northern end of the Cape Peninsula, Table Bay and a Dutch settlement in the area. 72 LE VAILLANT, F. Carte de la Partie M�ridionale de l'Afrique, pour servir d'intelligence aux deux voyages de Le Vaillant. Paris, H.J. Jansen & Perronneau, ca. 1795. Limites en col. d'�poque. Tr�s bel exemplaire. - In mint condition. Orig. outline col. 595 x 880 mm.